Mustang Watches - Look What's New This Season ! Mustang watches make a great present or a treat just because you deserve it ! And this season brings some cool new Mustang time pieces for men including the amazing 2012 Boss 302 time watch you see below. Check out the stitching on the Boss 302 watch and it's perforated leather strap, then compare it to the 2012 Boss 302 Mustang's seats. Now that's attention to detail. You'll notice right away that this is no ordinary watch. Styling cues are direct from the new Boss 302. And not just in it's realistic logo stripe. Check out the detailed miniature pistons that you use to set the time! It's also water resistant to 10atm and features a quarts movement for accurate timing. Click the blue link above for full details. 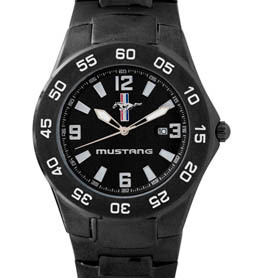 Here's a great looking and solidly styled mens watch featuring a classic Ford Mustang logo. Looking great in the picture, but better on your wrist, this Mustang Mens watch combines style with it's strong black metal band, which means it not only looks great, but it can stand up to what life throws at it. And to keep your investment safe, it comes with a classy collectible tin and a full 3 year warranty. Makes a cool and unique present for that special someone. For even more choices, check out the Ford Mustang watches section. 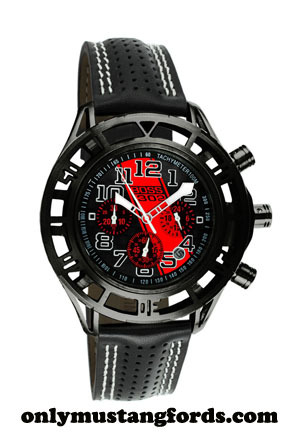 You'll find lots more mens and women's logo watches. Planning a holiday gift? Be sure to check out delivery dates and Xmas shipping details to ensure your gift gets there in lots of time for the festive season.